Want to know what life will look like on other planets? Look no farther than these five creatures, who are already prepared for life on Saturn's moon Titan - or in the hard vacuum of deep space. Unlike humans, with our pesky need for things like oxygen and sugar, some creatures are more flexible in the habitats where they feel comfortable. Here are five lifeforms who are prepared to live on other planets right now. The discovery of dense colonies of these one-to-two-inch-long, flat, pinkish worms burrowing into a mushroom-shaped mound of methane seeping up from the sea floor raises speculation that the worms may be a new species with a pervasive and as yet unknown influence on these energy-rich gas deposits . 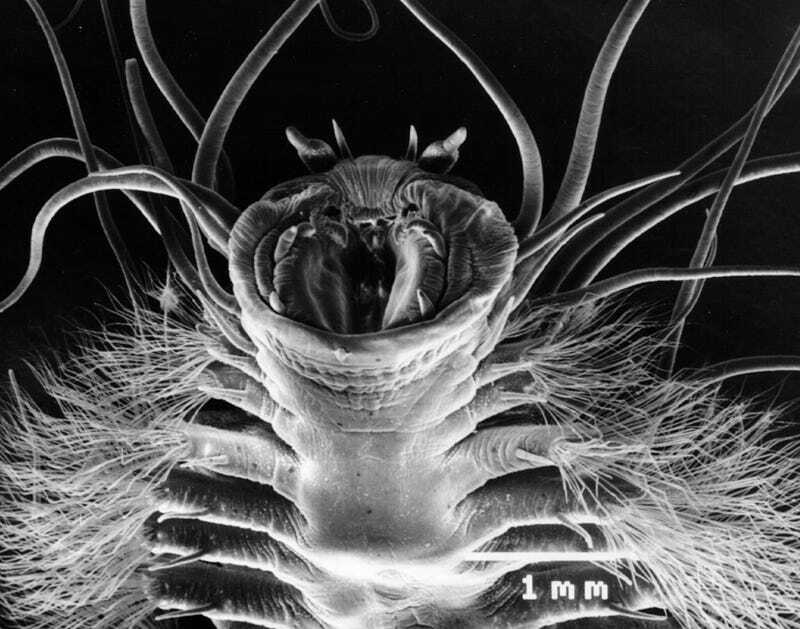 . . "It's very cool that while we're busy speculating about life on other planets we continue to discover new forms of life in the most unlikely habitats on Earth," commented Erin McMullin, a Penn State graduate student and a member of the research expedition that discovered the methane-ice worms. Methane ice, a gas hydrate, forms naturally at the high pressure and low temperature of the deep sea, but is usually buried deep in marine sediment. The Gulf of Mexico is one of the few places where hydrate can be found exposed on the ocean bottom. Occasionally this seeping, solid methane bursts through in mounds, often six to eight feet across. Here's an amazing, weird video of life around a methane seep off the coast of New Zealand. Here the creatures aren't living on methane ice, just methane gas mixed with water. What does this tell us about life on other planets? On Saturn's moon Titan, there are seas of methane gently lapping at the gorgeous beaches, lit by Saturn's glowing bands. If the proposed mission to sail Titan's seas ever gets underway, it's possible we may find creatures very similar to the ice worms living there. Tardigrades, also known as water bears, look like cute little sea caterpillars with eight legs. But these half-millimeter-long, transparent little guys are among the hardiest creatures on Earth. Native to icy regions, the tardigrade has one superpower: It can go into a suspended animation state called tun, during which it completely dries out and can withstand extreme temperature fluctuations. It can even withstand the vacuum of space, as researchers discovered when some tardigrades were sent on a space mission in 2008. What does that tell us about life on other planets? Now that the tardigrade genome is being sequenced and analyzed, we may learn how these creatures finesse suspended animation. And perhaps we can modify our own genomes to do the same thing for long space journeys. Plus the fact that they can exist in vacuum means that other organisms might have a tun-like state, drifting through space in search of new worlds to thrive on. They live at the edges of molten-hot volcanic vents deep beneath the ocean, and they feed on sulfides delivered to them by local bacteria. These giant tube worms, which can reach 7 feet in length, live a mile below the ocean surface under extreme pressure. Their tips are bright red because they're filled with blood - these worms are seriously packed with blood vessels. And they prefer live at the edge of "black smokers," volcanic vents where temperatures can be extremely hot. The interesting thing about giant tube worms isn't that they can withstand extreme heat, but that they can gain nourishment in an environment with chemistry radically different from our atmosphere. They're basically eating sulfides, which are abundant on planets like Venus, where it occasionally snows iron sulfide. Could tube worms thrive on Venus, with its heat and high pressures and sulfide weather? In Antarctica, a pool of seawater trapped beneath the ice is packed with microbes that have evolved to live without light or oxygen. The liquid, which comes from a pool of seawater that has been trapped inside the glacier for at least 1.5 million years, is alive with around 30 different types of bacteria with some unique chemical moves. The microbes have cycled through a million generations since being cut off, and live by slowly nibbling away at organic material trapped with them - likely to be "a mishmash of old 'skeletons'", according to Mikucki. To get energy from organic matter, living things break molecules' high-energy bonds. This releases high-energy electrons, which are passed down a chain of molecules, releasing manageable chunks of energy at each step. In humans and many other large organisms, oxygen is the final acceptor in this electron transport chain. But in the subglacial pool studied by Mikucki and her team, as well as in other extreme environments, there is no free oxygen to use for this purpose. Many microbes use sulphate as their final electron acceptor, producing hydrogen sulphide in the process. But Mikucki and her co-workers found no evidence that this was happening in the mysterious Antarctic pool. When the team looked at sulphate in their samples, however, they found evidence that the microbes had put the sulphate through chemical reactions. The researchers believe that the microbes are using sulphate as a catalyst in a complex chain of reactions in which the final electron acceptor is iron. "We think they are using it to get at the iron oxides," says Mikucki. Using iron as a final electron acceptor is not unprecedented. But using sulphate to do it is. In fact, many biogeochemists thought it unlikely that any organism could use iron in this way in the presence of a lot of sulphate, because iron and sulphate would just react together to make pyrite. And yet these Antarctic microbes are using iron as the final step in their electron transport chain not only in the presence of a lot of sulphate, but with its assistance. "This is how an ecosystem has sustained itself despite being covered by lots of ice in cold and darkness," says Mikucki. "Life finds a way." Like the tube worms, these microbes are able to gain energy and thrive on chemical compounds totally alien to typical Earth creatures. A creature that eats iron oxides, instead of photosynthesizing light or chomping on organic compounds like we do? It could possibly thrive in the salty, iron-rich seas beneath the thick layer of ice that covers Jupiter's moon Europa. D. radiodurans is a bacteria that can endure a thousand times more radiation than a person can, largely because of its amazing DNA repair system. People die of radiation sickness because tiny radioactive particles literally rip our DNA apart, which means (among other things) that our cells can no longer reproduce and basic body regulation systems are halted. But this bacteria is brilliant at reassembling shattered DNA. "The organism can put its genome back together with absolute fidelity," says Claire M. Fraser, of The Institute for Genome Research (TIGR) in Rockville, Maryland. This characteristic is what makes D. radiodurans so great, because even when radiation shatters DNA, it can be repaired by the bacterium proteins. Additionally, the microbe has between four and ten copies of its DNA, rather than the usual single copy. The additional genomes may allow the bacterium to recover at least one complete copy of its genome after exposure to radiation. One of the main problems with building a human outpost on the Moon or Mars is that we would be exposed to dramatically more radiation than we are on Earth (a lot of radiation from space bounces off our atmosphere and magnetosphere). What these microbes prove is that there's a way to harden DNA against radiation damage. So creatures on a planet with thinner atmosphere and weak magnetospheres could survive - or maybe, if we reengineered our DNA to be more like D. radiodurans, we could survive too. Blood falls image by Benjamin Urmston. Thanks to Marilyn Terrell for the inspiration!